Space Splice is the form of architecture only possible in video. First there is a long journey which, in splicing, brings together scenes shot in Europe, in the United States, and in India. The observer discovers a new movement without limits through which he sees a virtual network of hypothetical spaces. Van McElwee was born in 1948 in Meridian, in the United States. He lives in Saint Louis, Missouri. Currently, McElwee is Professor of Media and Video Area Head at Webster University, St. Louis. He graduated in MFA, in Multimedia from Washington University School of Art and Merit Scholarship and BFA in Printmaking from Memphis College of Art. 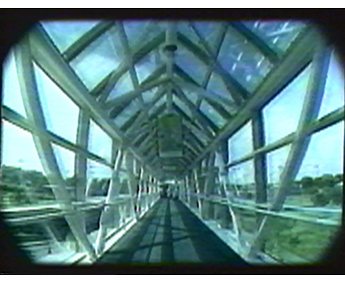 Van McElwee's body of work encompasses over thirty videotapes and installations and has received numerous grants and awards, including the American Film Institute Independent Filmmaking Award, The National Environment for the Arts Independent Production Fund (seven times recipient), and a travel grant from the Government of India. McElwee’s work has been exhibited extensively worldwide and he is represented by The Kitchen in New York, Trabant Gallery in Austria, Argos Gallery in Belgium, London Electronic Arts in United Kingdom and Heure Exquise! in France and Europe.